These granulated beads depicting a series of tiny hearts have been combined with pearls, which traditionally are associated with purity, innocence and peace. 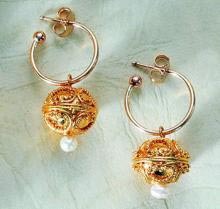 These earrings make use of the intricate technique of granulation, fusion of tiny gold balls in patterns on a flat surface. This technique in jewelry-making requires a high degree of skill, experience and knowledge. Vermeil.